The Academia Europaea (AE), The Academy of Europe, has awarded its prestigious Erasmus Medal in 2017 to Andreu Mas-Colell. Andreu is a Member of Academia Europaea (MAE) and its section “Economics, Business and Management Sciences”, a Fellow of the Global Labor Organization (GLO), and one of the most prominent European economists of our time. For more details on the medal and the award winner. 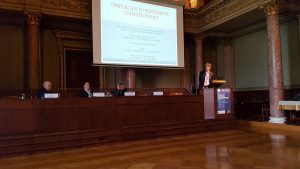 during the Academia Europaea 29th Annual Conference 2017 in the Hungarian Academy of Sciences, Budapest, on Tuesday September 5, 2017. “Obstacles to successful climate policy“. 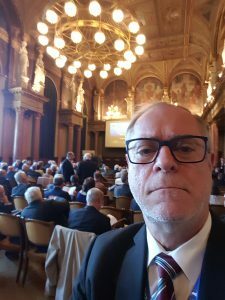 Also, Rick van der Ploeg is a Member of Academia Europaea (MAE) and its section “Economics, Business and Management Sciences” and a Fellow of the Global Labor Organization (GLO). 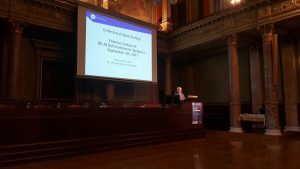 Andreu Mas-Colell delivering the Erasmus Medal speech.